I got to Gate 148 in the LAX International Terminal very early. The lounge was almost empty, thank goodness, for I wanted to sit close to the staffing desk. When the flight check-in people arrived, I hoped to be first in line to ask for an aisle seat. I had a ten-hour flight ahead and I’m an up-and-down-every-hour type of passenger. I sat two chairs to the only other person in that lounge, a nicely dressed Indian woman hand-sewing on something white. I assumed her nationality was Indian based on the tikka in the center of her forehead. I assumed also that she was on my Norwegian flight, and so I started a conventional friendly passenger conversation which includes Where are you going? Where are you from? Yes, she was from India, from Mumbai, but no, she wasn’t on my flight. Rather she was seated at that gate so she could see the departures board easily; she’d been in the airport already for six hours. She was coming from Canada and going to New Zealand, where she was now a home-owning citizen. The words ‘New Zealand’ immediately reminded me of the movie,“Lion.” She had not seen it. I told her briefly the true story of the 5-year-old Indian village boy who’d mistakenly get on a train to Calcutta, alone. After harrowing experiences and being unable to find his way home, he is taken in by an orphanage which arranges for him to be adopted by a couple in New Zealand. He grows up there, and as a young adult he sets out to find his original home in India via Google Earth. The astonishing conclusion to the movie shows him meeting his birth mother in the tiny rural village where he was born. My new friend was interested in the movie. She declared she’d find and see it, and we moved to talking about places and countries she’d visited. She’d not travelled outside India until she married at 48. How unusual, I thought, as Indian women generally marry much younger. Instead, she’d had a career in cosmetology. Since her marriage to a successful man in tele-com, she’d been all over the world—to many more places than I’d ever visited. She had siblings in Africa and in the UK. And when she spoke of those places, she’d reference how beautiful the Hindu temples there were; she made it clear she was affiliated with the Hari-Krishna movement. Again, how unusual, I thought, to reveal that personal information to me. 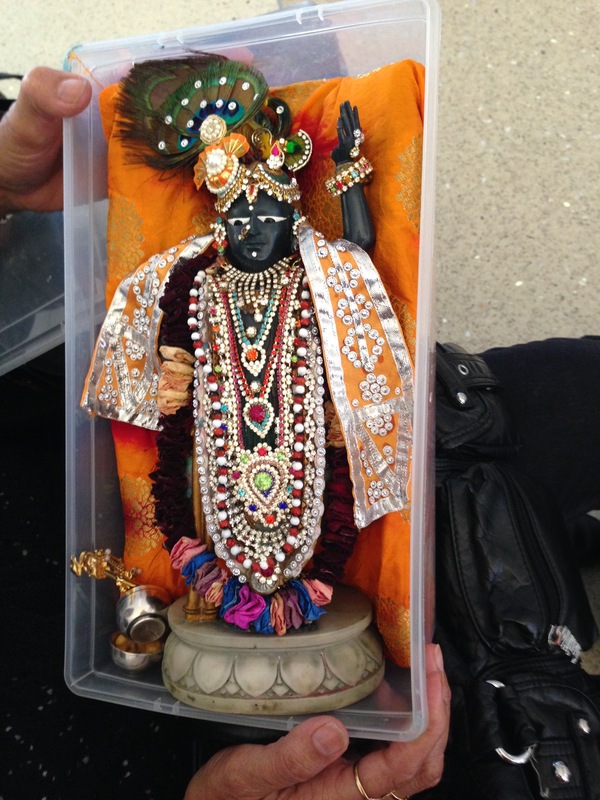 Then we spoke of Indian food…I mentioned I had a Hari-Krishna cookbook and really enjoyed Indian “meetaiee,” sweets. And at that point, she surprised me even more. 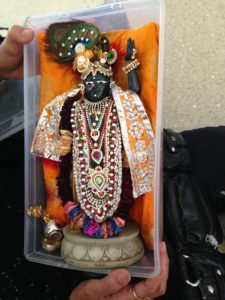 She asked if I wanted to see her Krishna. What? I thought, what is she talking about? 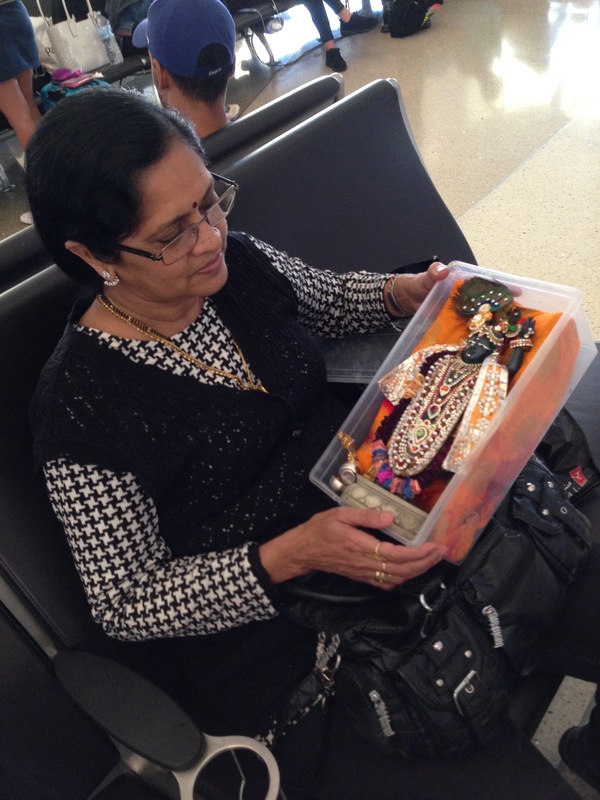 “I carry him with me whenever I travel,” she said. She turned to a large, zippered, purselike-bag on the seat beside her. Carefully she removed a shoe-box-sized clear plastic box. In it, like a collector’s Barbie, was a black “doll” with an elaborate cloak. Gently she lifted the lid so I could see it. She was proud and tender like a mother showing a newborn. I ask if I could take a picture. “Oh, yes,” she said, propping the box at an angle so I could get a good shot. Then she dug in her bag for something else: a little plastic bag with food. Carefully she took out a morsel and handed it to me. It was meetaiee, a ludhu, she had made herself. 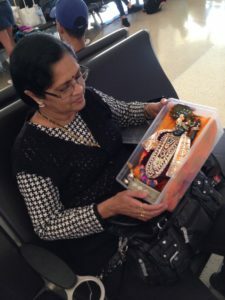 She was sharing with me a piece of Krishna’s food—the food she presented to him each day in her puja, her worship—for in Hinduism, I understand, there is the belief that the spirit of the god comes present at the time of puja and receives the spiritual essence of the offering. I ate the sweet meetaiee she offered me. It was absolutely delicious, like I remember Indian sweets from my childhood. What an incredible honor, I thought, to have been invited to share the food of the god. I could not thank her enough. The flight staff arrived. I leapt to the desk and politely make my request for a seat change. There’s a good chance it would be honored, the attendant said, but I needed to wait until everyone who was ticketed had turned up. I was relieved. My friend and I chatted a bit longer. I got my new boarding pass with an aisle seat. Boarding started. I said good bye to my friend and got in the line. I waved as I started out the door. Why or why, I thought halfway down the aisle, didn’t I get her name and contact. What a lovely friendship we might have had.